Fishing diving hunting paradise or surf on the great waves then home to a great 2 bedroom house with a spa, You will love it or enjoy the sun surf and beach with the kids. Alternatively visit an active volcano or read a book and just relax. Great walks or kiwi experience or just need a place for the night. Our place is a lovely warm house that has an awesome feel, fully furnished. We hope you will enjoy your stay. Hi We are a family of 6 with 4 boys. We live in Ohope which is our little slice of paradise, so generally if there is any issues, our local net work can solve them. We enjoy the lifestyle of Ohope and are into fitness with both Krys and I have completed the coast to coast multisport event and a few Marathons. Ohope beach lends itself for outdoor activities (walking, hiking, fishing, diving, hunting, mountain biking etc) We enjoy all of these activities. The property is unique and bigger than it looks. The spa (fits 2 people) which always ends the day nicely. It is a sunny location and very warm with the sun out. A short walk to the beach (50m) and about 150m to the harbour. For the golf lovers there is a golf course 10 minutes from the house. Great place for a relaxing weekend, if you want to just read a book or get away from the rat race. The beach is a lovely walk in the morning or if you want to mountain bike, kayak etc it is all here. It is a magic spot that you will enjoy as we have. If you have not been to White Island (NZ active volcano) the trip is great for you and the family. Or try to catch one of the massive Kingi's that are around or a nice pan sized snapper. The wharf is great for the kids to catch their first fish or for diving off. fishing, diving, hunting paradise, Surfing is great, learn to surf or learn the art paddle boarding. White Island Tours take you to one of NZ active volcano. There is an outdoor shower and a 2 person spa pool to complement the bathroom. The inside bathroom has a shower and toilet and double with the washing machine. It is quiet large. Fully equipped with lounge with 2 lazyboy chairs, lounge suite and fold out sleeping 2nd lounge suite and TV on free view. Standard 4 element stand up stove. Lots of books for the kids and adults. Lots of Board games in the 2nd bedroom. Deck around the house and outdoor space by the spa. It has stairs to get into the house. 2 person spa pool to relax in after a day or activities on the beach or multi sport competition. 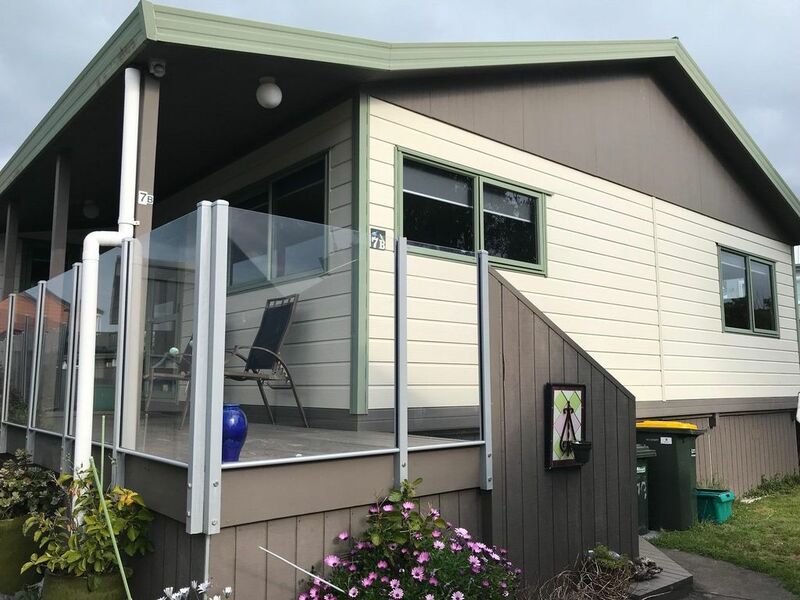 the home is well located for our work in Whakatane and has all the facilities and comforts you need while working away from home for a couple of week. Lovely beach house in quiet neighbourhood. Was a lovely place in a quiet neighbourhood and only a 5 min walk to beach.The house had everything supplied that you need,even a spa pool......great stay. Thank you Alan and we hope to return one day. Location was great - two minutes walk from Ohope Beach but due to the unclean presentation of the property, dirty sheets, windows which wouldn’t close, cobwebs, left overs from other stayers, used bars soap in bathroom and a strange smelll, not a property we would recommend to stay at. The above comment is inconsistent with all our other reviews. We have cleaners in after each guest stay, with sheets professionally cleaned after each stay. We had back to back guest staying over this period with all other reviews being positive. Great property! Awesome kitchen facilities. Clean and tidy. Blinds in the bedroom were great for sleep ins. Would definitely stay again. The only thing it was missing was a fan. Spa was an added bonus!! Awesome place, within walking distance to the beach, would definitely recommend. The WiFi didnt work, but it wasnt really a problem. Nice to stay in a Lockwood again. Very good sized and provisioned house in quiet cul de sac close to the beach. Would definitely stay again. Enjoyed the spa as well. Great place for relaxing in the spa after a multi-sport event, or go swimming or at the beach or the harbour, read a book, or just relax. Great deepsea fishing, diving or go to White Island (a New Zealand active volcano). The harbour has good floundering or if you want to go stand up paddle boarding, there is a school at the shop. When the surf is up the surfing is great at Westend. Excellent walks around Toi's track and mountain biking at the back of Ohope. After a long day you can relax in the spa pool or just enjoy the sun in NZ sunniest spot. Great beach holiday for you and the family.